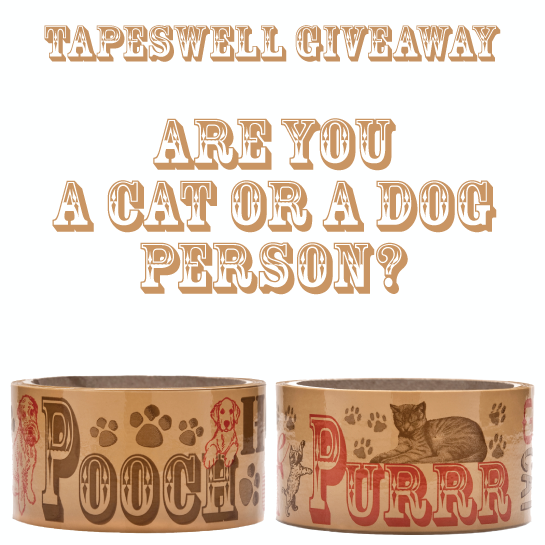 Decorative Tape in Action: Are You a Cat or a Dog Person? I heart kitty cats! Thx 4 the opportunity! Thanks Laurie! Be sure to post on Facebook, Twitter and wherever else you'd like to get more chances to win. Hi, Dog person for sure. My dog Roo is such a baby he is a Golden Retriever / Lab mix and weighs 150 lbs. He is funny though because he thinks he is a small dog. He is actually afraid of my sister's 2 1/2 lb toy poodle! In addition, he is also afraid of the dark, fireworks, plastic bags and going outside without his sister. Too funny! BOTH but I am more of a DOG person, and I am involved in rescue, and I have an Etsy shop dedicated to dogs and dog lovers! This tape would be PERFECT for taping up my packages I send out! I have wanted this tape FOREVER!! I'm on "team dog" all the way,we adopted our dog rusty 3 years ago. He is a 14 lb min pin / terrier (manchester or jack russell) mix. He gets to come to work with me, his favorite stop is when we go to the bank and he gets milk bones at the drive thru! We have no creatures at the moment...but we love cats! An orange kitten would be nice! Definitely Dog!! However, kitties are adorable. Yeah, definitely Dog! She knocks on the door when she has to go out, her name is Tallie, 1/2 lab 1/2 Aussie. Dogs, dogs, and more dogs! I do volunteer work with cocker spaniels and would love having this tape. Allergic to both, but I believe I would be a dog person, those little puppy faces are so cute! Allergic to both, also, but have 6 in our home at the moment. My particular kitteh is Little Bit, who is curled up snug in a box next to me. She's orange and white and I love her to pieces! Definitely a dog person! We have a Weimaraner who is like our child :) He is such a great dog, and everyone loves him!! Dog all the way! I have 3!